WASHINGTON—The American Academy of Actuaries will continue to offer public policymakers unique insights on financial security and risk issues from the U.S. actuarial profession’s perspective as legislative and regulatory efforts in Washington come into focus after President Trump’s State of the Union address tonight. American Academy of Actuaries volunteers present a Capitol Hill briefing on Rx drug spending in March 2018. The rising costs of health care services and prescription drugs and how to address them. 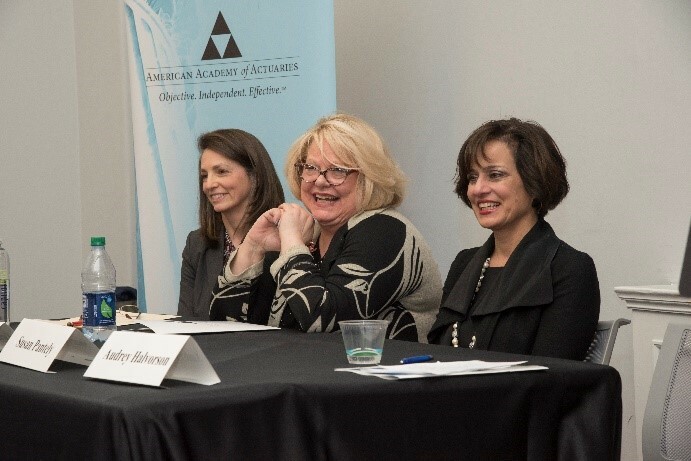 In March 2018, the Academy hosted a Hill briefing on the analysis contained in its issue brief, Prescription Drug Spending in the U.S. Health Care System: An Actuarial Perspective. In fall 2018, the Academy released research on the potential cost savings for health care services that could be realized through reference pricing. The risks to multiemployer pension plans, their beneficiaries, plan sponsors, and the Pension Benefit Guaranty Corporation, and the policy options available to financially stabilize plans and the system. In 2018, the Academy testified before the Joint Select Committee on Solvency of Multiemployer Pension Plans, and provided extensive answers to follow-up questions from the committee. The Academy’s Pension Practice Council continues in its efforts to help address the system’s challenges. The financial condition and sustainability of Social Security and Medicare based on the 2018 trustees’ reports. The expansion of association health plans, short-term, limited-duration insurance, and health reimbursement arrangements, and how these and other regulatory or legislative changes could affect risk pools, coverage, premiums, and health insurance markets. The need to modernize the country’s retirement system and provide lifetime income options for the country’s aging population. If new legislation or regulations to improve retirement security are considered, the Academy can explain the available options in the context of the increasingly defined-contribution dominated retirement system, including lifetime income options. The financial challenges facing the National Flood Insurance Program, and specific insurance market, technological, and other developments that Congress should take into account as it considers reauthorizing the program beyond May 31. Climate trends, on which the user-friendly Actuaries Climate Index® provides objective information. The Actuaries Climate Risk Index, a second index correlating climate risks to economic losses and other impacts, is under development with release planned for later this year. Insurer solvency and domestic and international insurance regulation. Learn more about the Academy’s work on these and other public policy issues under the “Public Policy” tab at www.actuary.org. The American Academy of Actuaries is a 19,500-member professional association whose mission is to serve the public and the U.S. actuarial profession. For more than 50 years, the Academy has assisted public policymakers on all levels by providing leadership, objective expertise, and actuarial advice on risk and financial security issues. The Academy also sets qualification, practice, and professionalism standards for actuaries in the United States.